Iraqi Refugees Struggle For Peace In America The Iraq War may be officially over, but for thousands of Iraqis who fled to America during the conflict, there's no going home. Many left successful careers to settle in Detroit, where finding a future is a challenge. The Iraq War may be officially over, but for thousands of Iraqis who fled to America during the conflict, there's no going home. Many left successful careers to settle in Detroit, where finding their future is a challenge. The U.N. estimates several million Iraqis are now refugees — either inside Iraq or outside the country. Almost 60,000 of them have come to the Detroit metro area since 2006, drawn by the large Arab community that's been there for years. "There are mosques, schools, churches and neighbors," says Rifat Ita, a counselor with Lutheran Social Services of Michigan, one of four resettlement groups in Michigan. "We have the infrastructure to help new arrivals." But what Michigan does not have is enough jobs to meet demand for anyone, let alone this group. That falls harshly on refugees, particularly the professional class, which is often middle-aged and older. At the Bellagio Banquet Hall in Southfield, Mich., lights blaze nightly and the atmosphere is welcoming. The Bellagio posts its name in both English and Arabic, and inside the scene is straight out of old Baghdad. Scores of men sit in shirt sleeves or business suits, smoking the water pipe, or narguile, and playing dominoes. The late, legendary singer Umm Kulthum laments on the sound system. Time has agreeably stopped for male camaraderie. 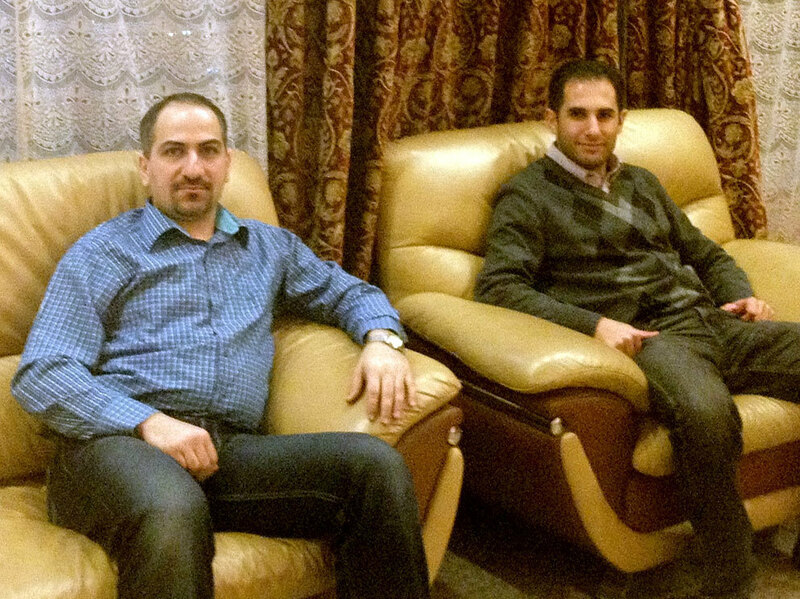 Sayf al-Tabaqchali (left) and his best friend, Yaser al-Hadithi, are repeating their medical residencies in the U.S. after leaving Baghdad. Yet even when the environment is as safe and familiar as it is here, a sense of fragility lurks just below the surface. "When we were there in Baghdad, we didn't know who is the enemy," says Sayf al-Tabaqchali, a medical resident. He left Iraq in 2006, his doctor's career over before it began. "The government, the militias, the Iraqi resistance group, the police — everybody is maybe a threat." Two of his cousins were kidnapped and killed, he says. Several friends and some professors were kidnapped, too. About half his class emigrated, Tabaqchali says, just like he did. Tabaqchali and his best friend, Yaser al-Hadithi, are both 31. Hadithi is a medical resident, too. Both have had to pass examinations, get new licenses and repeat their residencies in pathology and internal medicine now that they're in the U.S. They're actually optimistic about their futures, but talk quickly pivots to older relatives. "It's very hard for the older people," Hadithi says. "Because of the language barriers, because they can't work, you know, they don't have relatives, friends who can help them. For example, my father went back to Jordan; I'm not sure if he's coming back or not." Khaldoun al-Azawi and his wife, Imam, are both 50, college-educated, charming and poised. In their rented home in Dearborn, they recall the moment at a checkpoint when soldiers fired on the family. We miss our family, our parents, but there is no other choice. "I just lift my head to see if my kids are alive or they are dead," Imam says. "It is too hard, too hard. I can't forget that." In that moment, Khaldoun decided the family would flee. The couple loves Michigan, but in three years, they've not had one job offer. Until the war, life was about success. They met in college. He built up a business selling fuel pumps to gas stations. He even returned to Iraq last year to see if he could line up exports of American products. That didn't work out, so they turned to the U.S. government for support — food stamps and Medicaid. And in a reversal of the coming-to-America story, the relatives who stayed behind in Iraq are helping out financially. For now, Imam and Khaldoun have thrown themselves into their four children's lives, helping with homework, going on class field trips — anything to keep focused and positive. They do not want to go back to Iraq; in fact, the Azawis are proud of being on the road to U.S. citizenship. "In a few more years, I will be a citizen here," Khaldoun says proudly. "We miss our family, our parents, but there is no other choice. Ask my son where he is from, and he will say, 'Iraq, but I'm an American.' "
A new study is evaluating the psychological cost borne by Iraqi refugees — and there is a lot of cost. The National Institute of Mental Health is sponsoring the study, carried out by researchers at Wayne State University. It is comparing a random sample of 300 Iraqi refugees from their first couple of months in the U.S. over the next three years with 300 non-refugee Arab immigrants. The study has found that Iraqi refugees arrive in America already heavily stressed, and then joblessness and loss of identity pile on top of money woes. Dr. Yusif Rofa, a psychiatrist on the research team, says it's causing deep depression for many of the refugees. "I met a refugee, she was kidnapped when she was in Iraq," Rofa says. "She's having problems here." The woman spent two days in prison for fighting and resisting arrest. "She might be deported back." Rofa has also seen some Iraqi professionals turn around and go home. "About six months ago, there was an Iraqi doctor with his wife — who is also a doctor — and their son who came as immigrants to the U.S., and they had relatives here," Rofa says. "They stayed only for one month, then went back." Confused, Rofa asked the doctor how he could possibly return to Iraq. "I am too old to start studying again. Back home, I at least have a job. My wife has a job," Rofa said the man told him. But what about your son, who might get kidnapped? Rofa asked. "Well, I have to take that risk," the doctor said. Rofa himself was given asylum in the U.S. in 2006. His wife, once a dentist in Iraq, now works as a Kmart cashier. They couldn't come up with the $200,000 it would cost to retrain her in America. 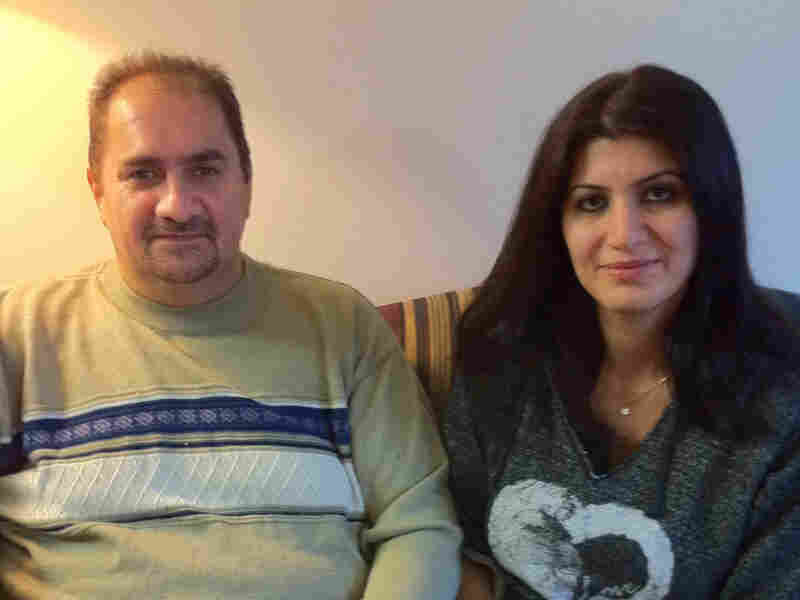 Hesham Abdul Ghani and his wife, Oras Touma, came to Michigan to escape religious persecution. Yet Rofa and the other researchers are also finding stories of resilience. For the most part, the Iraqi refugees work hard, going to community college or attending free English classes. Many new arrivals want help with their resumes, or ask for informational interviews or volunteer — anything to enhance their potential job profiles. Oras Touma, 36, came to Michigan 10 months ago to escape religious persecution. She and her husband, Hesham Abdul Ghani, 42, are Mandean Christians, followers of John the Baptist. Pictures in their small apartment show their son and daughter wearing white and being baptized in Michigan streams. The family had a nightmarish decade. In 2002, Touma survived a kidnapping attempt by Saddam Hussein's kinsmen. The family fled to Yemen, then returned to Iraq, facing religious discrimination all the while. Now in Michigan, Touma and Ghani, both engineers, spend a lot of time looking for work. "We are trying. We made our resumes, and we are searching on Google, we are searching on companies," Touma says. They even approached one engineering center and offered to work as volunteers. This week, Touma got some good news. She's going to start work next week as a supervisor for an international call center. She may indeed have a happy ending to her story. War doesn't claim its victims all at once; sometimes it takes years. 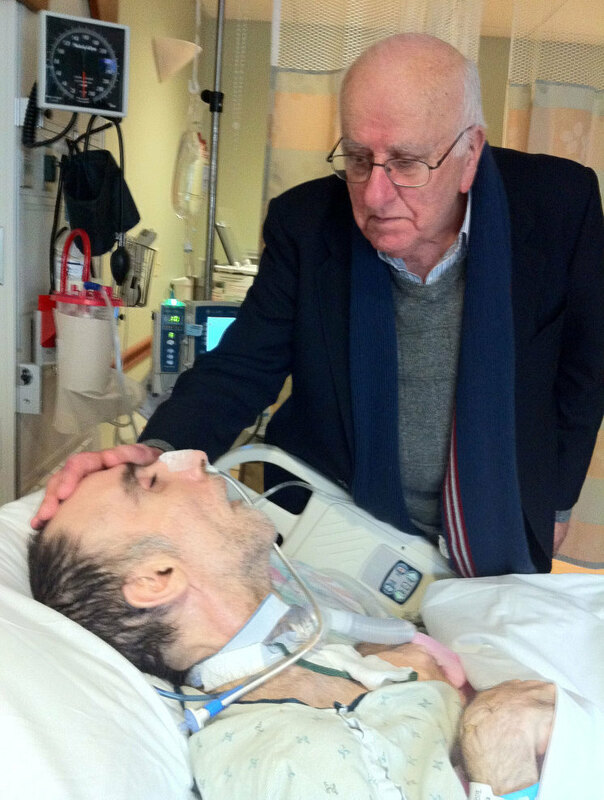 At the William Beaumont Hospital, a giant complex in Royal Oak, Mich., Dr. Najeeb Hanoudi bends over his comatose son, Nazar, kept alive on life-support systems these past eight years. Dr. Najeeb Hanoudi was a prominent eye surgeon in Baghdad, but came to Michigan seeking care for his son, Nazar, who was shot accidentally by an American soldier in 2004. Nazar died last week. In 2004, an American soldier accidentally shot Nazar, leaving him in a vegetative state. Hanoudi, a prominent eye surgeon in Baghdad, would never have come to America but for this. The 77-year-old and his wife, Firyal, are worn out and ill from the hours spent at their son's side in the nursing home. After the shooting, Hanoudi says, an American official visited them. "He came one day and saw us at home in Baghdad. And when he left, he said, 'I'd like you to write me something as a kind of reminder or a report or something.' "
Hanoudi later wrote the official, saying, "We are waiting for a miracle." "There has never been a miracle," he says. Hanoudi isn't angry at the shooter. He's not even bitter that he was forced to leave his life in Baghdad for a nursing home in Michigan. He is, however, deeply angry about the war. "In the end, the war proved to have been something crazy. Stupid. What for? Why did the Americans went there?" he says; there were no weapons of mass destruction. "Five, six thousand kids were killed. Dozens of thousands of people who were injured. Hundreds of vegetative cases — which I have seen myself in Walter Reed Hospital, you see," he says. "Americans. Young ones. What for?" Just days ago, Nazar died. That part of the Hanoudis' story is, at last, finished. Their hopes now rest on their other children and Nazar's young daughter — whom Nazar never met. Yet to a person, all the refugees in this story, whatever their struggles, their sorrows, their longing for an Iraq that no longer exists, not one person wanted to return. They have set their sights on America now, and here, they will remain.